TEMA RICERCA offers many tools for endocrine research including assay kits, antibodies, and proteins to study peptide hormones, steroid hormones, their receptors, as well as reagents to study eicosanoids. 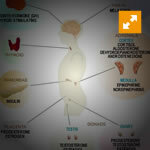 The endocrine system is made up of glands or cell types that secrete regulatory hormones into the bloodstream. Primary endocrine glands include the pituitary, hypothalamus, thyroid, parathyroid, pancreas, testes, ovaries, and adrenal glands. The hormones they release modulate an array of physiological functions including metabolism, blood pressure, appetite, development, and reproduction. Hormones can be roughly divided into two classes, peptide/amino acid-derived hormones, and the steroid hormones, most of which are derived from cholesterol. The peptide hormones generally bind cell surface receptors and initiate signal transduction cascades, while steroid hormones are membrane permeant and bind intracellular receptors that modulate transcription. 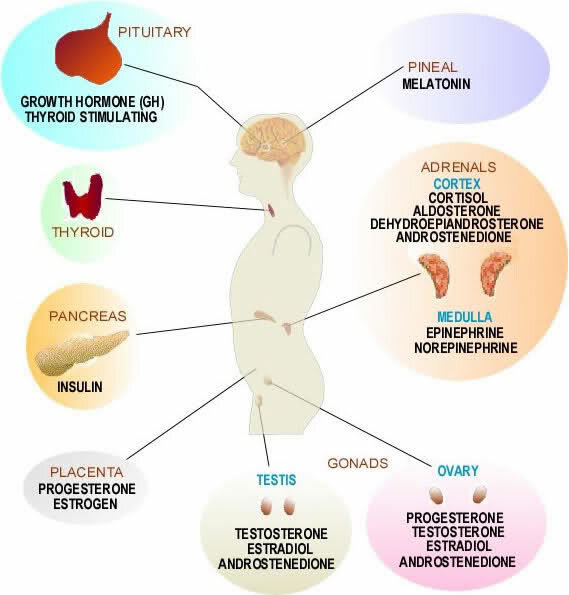 Serious medical conditions arise from endocrine gland dysfunction including diabetes (pancreas), Grave´s disease (thyroid), Hashimoto´s thyroiditis (thyroid), and Addison's disease (adrenal gland).